This spring the Montana Family Medicine Residency received an honor surpassing any other in the 20-year history of the Residency – the DeWitt C. Baldwin Jr. Award. Awarded by the Accreditation Council for Graduate Medical Education (ACGME) and the Arnold P. Gold Foundation, the DeWitt C. Baldwin Jr. Award recognizes sponsoring institutions that foster a humanistic culture that supports a respectful, supportive environment for medical education. The award emphasizes the joint responsibility of health system and graduate medical education leadership for delivering high-quality healthcare while simultaneously supporting the personal and professional development of learners and faculty. RiverStone Health shares this honor with St. Vincent Healthcare and Billings Clinic — our partners in the consortium that is the Sponsoring Institution for the Montana Family Medicine Residency. A little bit of background helps explain why this award is so special. 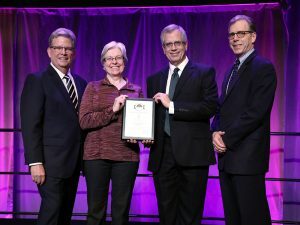 Pictured Center: Roxanne Fahrenwald, MD, and John Felton, President & CEO of RiverStone Health, during the awards ceremony in March at the ACGME Annual Educational Conference. Of the 800 medical residency institutions, ACGME invited only 60 to apply. Six organizations were chosen as finalists and received site visits by members of the Gold Foundation and ACGME who conducted extensive interviews. The two other institutions recognized were: Vanderbilt University Medical Center, having more than 900 residents and fellows in 90 programs, and Virginia Commonwealth University, which has more than 200 new residents and fellows each year in 80 programs. MFMR has 24 residents and one fellow. The award emphasizes the joint responsibility of health system and graduate medical education leadership for delivering high-quality, healthcare in a humanistic environment that supports the personal and professional development of residents and faculty. It also highlights innovations and best practices essential to continually improving resident education and patient care. ACGME accredits residency and fellowship programs and provides resources to support graduate medical education. The Gold Foundation aims at creating the gold standard in healthcare by supporting clinicians in sustaining “humanistic passion” through their careers. The award underlines the positive, supportive learning environment fostered by the sponsoring institutions – RiverStone Health, St. Vincent Healthcare and Billings Clinic.